Hedgehogs are dying out. Their numbers have plummeted in recent years and we want to make sure the Heatons Hedgehogs are given the best chance of survival. Hedgehogs love to roam and they need about a mile’s worth of gardens to ensure they get enough food. To help create the Heatons Hedgehog Highway please talk to your neighbour(s) and agree to put a 13cm x 13cm hole in the fence and tell SLH about it so we can mark it on our Heatons Hedgehog Highway map. What can you do to help the Heaton’s Hedgehogs? Whoops! Hedgehogs are very nosey creatures and are forever getting stuck in drains and holes. Make sure all drains and pipes in your garden are covered. Hedgehogs love the bugs and insects that love ponds and if you have a pond they will wander over to them and have a good look. They are not very good swimmers so make sure there is an escape route (e.g. ramp or rocks) to help them get back out of the water. Hedgehogs also get stuck in litter and netting so try to avoid plastic netting, even the discarded netting from fat balls can cause problems for hedgehogs. Hedgehogs love to eat slugs and beetles and are great predators to attract to your garden but slug pellets and pesticides are poisonous to hedgehogs. Avoid using them in your garden. Ask at the Garden Centre for hedgehog friendly products. If you garden grass has gotten long always check for sleeping hedgehogs before mowing and especially before strimming. Strimmers hurt thousands of hedgehogs each year. Hedgehogs love piles of leaves, gaps under the shed. Resist the temptation to tidy up too much. Putting out food will encourage them to visit again and again. They love dog food, meal worms and sunflower seeds or you can buy special hedgehog food too. Place the food under an upturned washing-up bowl with an entrance (13cm x 13cm) cut out as this will stop other animals tucking in before the hedgehog has had chance. Leave out some fresh water too but never leave out milk – it is harmful to hedgehogs and will cause them to get very sick. Want to be a hedgehog champion? Hedgehogs, being nocturnal, are difficult to spot and through using carefully monitored trackers we’ll know for sure if there are or are not hedgehogs in the Heatons. We want as many champions as possible to agree to put a tracker in their garden for one week to monitor hedgehogs in the area. The tracker is a triangular tunnel, open at both ends. In the middle is the ‘bait’ – hedgehog food – and on either side are ink pads. At both entrances is a sheet of white paper. 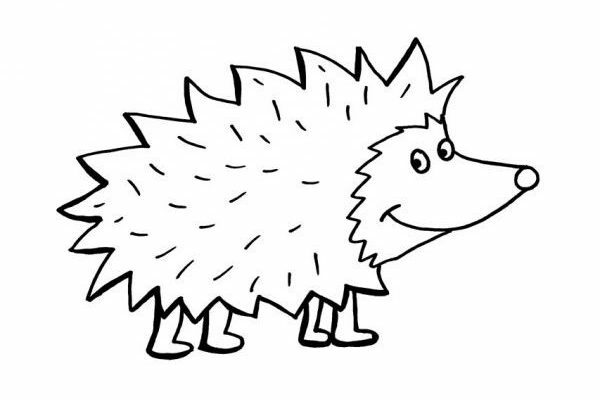 The hedgehog will walk through the tunnel, eat some food, get some paint on his or her paws then carry on, leaving pawprints on the white paper. What do we want our Hedgehog Champions to do? Contact SLH and confirm you are willing to have a tracker in your garden for one week and report back to SLH on the pawprints found. We also want everyone to chat with their neighbours / friends / family / work / church / sports club in the Heatons? Would they also like to have a hedgehog tracker for a week? The more trackers we have across the Heatons the more likely we will find traces of the Heatons’ Hedgehogs. Update: We are only in the second week (April 22nd) of the trackers and already hedgehogs in two separate areas of the Heatons have been identified! Do drop SLH an email if you want to have a tracker an see if you have hedgehogs coming to your garden. 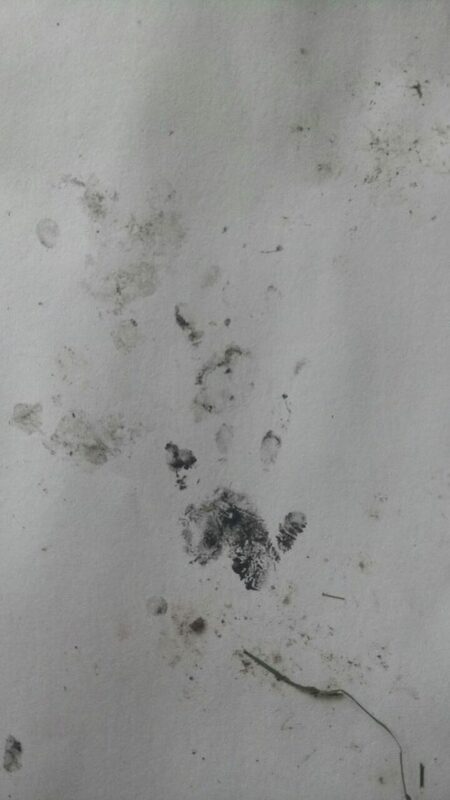 This photo shows our first set of pawprints!